Prepair™ contains Tex-OE™, a patented, all-natural extract formula derived from the fruit of the prickly pear cactus (Opuntia ficus indica), an important food for millions of people in tropical and subtropical countries. The proprietary extract in Prepair™ works in response to physical stress by accelerating the synthesis of important protein substances in the body known as Heat Shock Proteins or HSPs. What are Heat Shock Proteins (HSPs)? HSPs are the body's natural protective and recovery response to physical stresses known to damage protein molecules in muscle and tissue cells. Proteins are the body's building blocks for muscles and tissues and play an important role in practically every chemical reaction in the body. Extreme variations in temperature, altitude, pressure and oxygen levels, as well as exposure to UV rays typically encountered in intense sporting activities, or even sunbathing, can disrupt or damage protein molecules. HSPs prepare your body to handle environmental challenges better by enhancing the tolerance to stress in cells, and protecting and repairing cellular protein molecules damaged by physical stress. How does Prepair™ work in the body? The human body has no immediate response to physical stress. Temperature variations, oxidative stress and other reactions caused by intense exercise or extreme sports stimulate the body's natural synthesis of HSPs. Tests show that it usually takes the body 2 to 3 hours to elevate HSPs in response to these stresses. Preconditioning with Prepair™ enables the body to accelerate the synthesis of HSPs within 10 to 15 minutes after the onset of physical stress and prepares the body for an early response to physical stress, and protects cellular protein. How does a more rapid HSP response benefit me? By accelerating HSP response time with Prepair™ you can protect protein in muscle and tissue cells and facilitate faster repair and recovery of stressed cells. Preconditioning with Prepair™ improves resistance to physical stress, allows the body to respond to stress within 15 minutes, and reduces fatigue and soreness. Studies show that preconditioning with Prepair™ reduces consumption of the body's natural supply of HSPs while maintaining increased HSP levels for 3 days. This allows the body to respond to continuing stress or the next occurrence of physical stress. How long do the protective effects of Prepair™ last? Who can benefit by preconditioning with Prepair™? 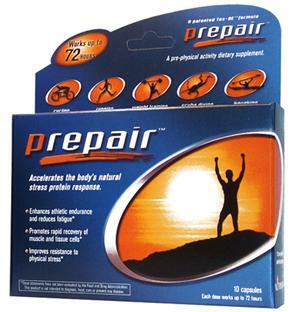 Prepair™ can benefit anyone involved in challenging physical activity or training: triathletes, runners, cyclists, mountain bikers, climbers, kayakers, scuba divers, martial arts enthusiasts, boxers, skiers, race car drivers, skydivers, weekend warriors and those engaged in just about any other physical activity. Prepair™ also reduces the uncomfortable effects of air travel (jet lag). As we age, our ability to quickly respond to physical stress diminishes. Prepair™ accelerates and enhances HSP performance in active adults of any age. NO RISK is another reason to try Prepair now. Because if you're not completely satisfied with Prepair, within 60 days from date of purchase, simply return a minimum of 50% of the capsules, unopened, in the original blister pack, with your purchase receipt. We will give you a full refund. Tex-OE is a patented, natural active extract from the skin of the fruit of the Opuntia ficus indica. Some of the names by which the Opuntia is also known are barbary fig, Indian Fig, Nopal or, most commonly, the prickly pear. Since pre-historic times, desert natives in North and South America have consumed the fruit and pads of this member of the Cactaceae family. Spanish explorers carried this and other cacti species to Europe over two centuries ago and not long after, the Moors introduced the Opuntia to Africa . People in many parts of the world enjoy eating the prickly pear fruit, and consider it an important nutritional source. The succulent reaches 15 feet in height (4.5 m) and typically spreads about 10 feet (3 m). Its fruit, referred to as "tunas," are cylindrical-shaped with a red to purplish color. Tunas are a food source for certain desert creatures and humans use it to make jelly, red dye, face cream and to purify water. The pads are food for a wild boar-like Sonoran animal named the javelina as well as domesticated herd animals in countries such as Malta. The Opuntia grows in some of the hottest, most arid environs of either hemisphere. During the spring months it enhances the desert landscapes with its colorful yellow, orange, or reddish flowers. It requires little water and is hardy in temperatures as low as 15°F (-10°C) and in altitudes as high as 7500 feet (2250 m). When considering the circumstances under which Opuntia grows, it is surprising that the plant survives. Typically, aggressive conditions such as these alter an organism's biologic processes including cellular protein syntheses and ultimately lead to a change in the species' genetic material. Opuntia is able to grow and proliferate with exposure to such aggressive conditions because it possesses an intrinsic protective ability that not only restores genetic material but also repairs any insults to its structural integrity. As a Cactaceae, the Opuntia belongs to one of three families of plants that possess a special chlorophyll metabolism that results in a carbon cycle known as CAM (Crassulaceae Acid Metabolism). It appears that CAM provides members of the Cactaceae, Crassulaceae and the Saxifragaceae families with a special protection that allows them to maintain the integrity of their genetic material and survive normally devastating environmental conditions. In addition, members of the Cactaceae family have the unique ability to produce an ingredient that induces the synthesis of heat shock proteins (HSPs) in humans. Discovered within the past 25 years and common to all living organisms, HSPs protect histones. More precisely, HSPs act to guarantee the structural perfection of the proteins an organism manufactures as it articulates genomic instructions. To fully comprehend the depth and breadth of the notion of HSPs and their impact on man, it is necessary to adopt the concept of "stress" as defined by Hans Selye, the Canadian physiologist, in 1936 . Dr. Selye redefined "stress" for the scientific community to describe not a force or aggression undergone, but rather the reaction state of the organism subjected to a forceful aggression. The aggression can be mental such as overwork, emotional shock, or the perception of danger. The aggression can also be physical such as that encountered by athletes in training or even "weekend warriors" who physically tax their bodies once or twice a week. Variations in temperature from changes in ambient conditions or extreme physical activity, ROS (reactive oxygen species), RNS (reactive nitrogen species), UV radiation, alcohol toxicity, infective processes, acid-base balance changes due to metabolic or respiratory influences, all impose stress on the human body. The human body has no immediate protective response to stress. Scientists have documented that approximately 120 minutes after an exposure to stress the body preferentially synthesizes HSPs. HSPs counter the effect these insults have on the body's cellular products and increase the cells' ability to recover from the damaging effects of mental and physiological stresses . HSPs are the cellular tools responsible for folding newly synthesized proteins; protection of the integrity of nuclear and matrix material; repair of altered proteins; and elimination of damaged proteins. Approximately 2 hours after exposure, HSPs are available to help the body respond to psychological (worry, tension), chemical (poison), physical (ionizing radiation, pH, osmolarity), biological (cytokines, infection) or mechanical (articular microtraumas) aggression toward the organism. HSP titers remain stable for 4-5 hours after the insult at which time levels decrease due to cellular consumption. During this 4-5 hour window circulating HSPs protect the body from any subsequent insults, enhance survival and minimize cellular, tissue, and organ damage. If there is a repeat stress after the level of HSPs declines to their basal level, the body must gear up to synthesize HSPs again. While this call to action may not take as long, the levels of HSPs achieved may not reach those of the original response. This second level of response may or may not be adequate to protect all cells from the new aggressor. If one considers the stressful circumstances in which the Opuntia survives and thrives, it is not beyond the realm of reason that scientists can demonstrate that Tex-OE, an extract of the Opuntia fruit, enhances the ability of the human organism to accelerate its synthesis of HSPs and thus protect itself against aggressions. Until now most substances known to promote the syntheses of HSPs are also known to be cytotoxic. In standard acute and oral toxicity studies as well as mutagenicity studies, Tex-OE was shown to be neither cytotoxic nor mutagenic. Tex-OE has therefore been deemed safe for ingestion making this discovery particularly important . One of the hallmarks of physiologic aging is an altered response to emotional and physiologic stress. While in some cases, baseline physiologic parameters among the elderly are in parity with younger individuals; in general, the elderly exhibit a diminished capacity to mount a timely and sufficient protective response to stress. (Figures 1 & 2) In addition, abnormal proteins, a result of a number of processes associated with aging, accumulate. In a study examining the effects of age on HSP response using human peripheral lymphocytes, Rao, et al  determined that there exists an age-related attenuation in the response of HSPs. Verbeke, et al  showed that in vitro however, that repeated mild heat stress resulting in an increase in the basal level of HSPs, prevents the onset of various age-related changes during cellular aging. Thus it appears that the availability of a sufficient level of HSPs before, or early in the exposure to stressful conditions, can protect organisms from at least some of the ravages of aging. Preconditioning with Tex-OE offers this precise type of cytoprotection by accelerating the synthesis of HSPs. Aging athletes find these data of particular interest as they indicate that by preconditioning with Tex-OE aging athletes can continue their workouts without fear of amplifying the natural aging process due to the physical aggressions to which they expose themselves. Exposure to sufficiently severe stressful conditions can be the cause of extreme morbidity if not mortality. In the case of the athlete, numerous scientific investigations indicate that physical exercise augments the generation of ROS and RNS , , . In their review article, Niess, et al cite multiple references linking the damaging effects of ROS/RNS in terms of oxidative stress to features such as exercise-induced damage to muscle tissue and leukocyte DNA thus effecting immune function 8. Research indicates that naturally induced HSPs antagonize the oxidative damage that occurs in exercise-induced ROS/RNS synthesis thus protecting the athlete from tissue damage. Tex-OE accelerates the rate of natural HSP synthesis. With any aggression, the amount of damage the organism sustains depends upon the lapse of time between insult and the initiation of reparation and protection. Pre-conditioning with Tex-OE decreases the amount of time necessary to raise HSP titers to just 15 minutes. This is at least 45 minutes before non-preconditioned cells can even synthesize HSP mRNA (figure 3). When preconditioned cells can begin to repair damage in 15 minutes, there is less damage and less morbidity. Further, the pool of HSPs is not exhausted and the remaining HSPs can provide their protective effect for a longer period of time (2-3 days). Researchers at the Institute for Cellular Pharmacology have performed and sponsored multiple in vitro and in vivo human studies using Tex-OE. Summary charts detailing these studies follow this section. None of the human subjects in any of the above studies experienced any side effects from Tex-OE or any adverse reactions. To date, there have been no reports of drug-to-Tex-OE or supplement-to-supplement interactions. Fiber interferes with the absorption of Tex-OE so taking Tex-OE in temporal proximity to fiber-containing foods and beverages will render it inactive. To achieve the highest absorption and activity it is best to avoid taking Tex-OE 2 hours before and 2 hours after eating or drinking foods or beverages that contain fiber. Those regularly exposed to stresses (professional athletes, amateur athletes in training, those traveling between time zones, etc.) find that taking Tex-OE every three days maintains their preparedness to face the physical challenges associated with these activities. As indicated by these studies, athletes and others who took Tex-OE as directed before exposure to stress benefited from an earlier "call to arms" of the body's natural protective mechanisms. These protective mechanisms defended proteins in muscle and tissue cells and facilitated a faster repair and recovery. Preconditioning with Tex-OE improves resistance to stress, allows the body to respond to stress within 15 minutes and reduces fatigue and soreness in muscle cells. Athletes who take Tex-OE found that they can workout more often and more effectively, play harder and endure longer workouts without the activity-limiting effects of muscle exhaustion and soreness. Download Monograph Charts in PDF format. I truly believe in this product! "I have used Prepair off and on. I noticed a real change on how I felt during and after the HURT 100 mile trail race in Hawaii 3 weeks ago. I was one of 8 finishers out of 33 runners. And one of only two female finishers. I have never felt so good after running a 100 race. I was out there for 35 hours and my muscles never got very sore. I truly believe in this product. I am still experimenting with it. I will use it in a 31 mile trail race Saturday. I will also use it at Catalina on the 24th 100k. By the way, I ran 20 miles two days after the 100 miler with no muscle fatigue. I was amazed. If you need to use me as a testimonial you can."